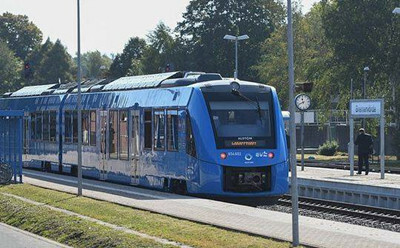 The world's first hydrogen powered trains havebegun running in Germany. They began carryingpassengers Monday in Germany's northern LowerSaxony state. The new trains will run 100-kilometertrips and can travel up to 140 kilometers an hour. A French railroad company called Alstom built the two trains. Teams in Germany and Francecooperated on the project, which was supported by the German government. The new trainmodel, called the Coradia iLint, signals the beginning of efforts in Germany and other nations tomove away from pollution-producing diesel trains. The Coradia iLint is designed to run on non-electrified train lines with low levels of noise. It usesa process that combines hydrogen and oxygen to produce electrical power. If the systemproduces more energy than the train needs at that time, it can store the extra energy inbatteries. The only emissions are water and steam. A single tank of hydrogen can run a Coradia iLint train for about 1,000 kilometers. This isvery similar to the distance a diesel-powered train can run on with a single tank. Hydrogen-powered trains cost more than diesel trains to build. But Alstom officials say theoperating costs are much lower. The company plans to provide another 14 Coradia iLint trainsto Lower Saxony by 2021. The head of railroad operations in the area, Carmen Schwabl, praised replacing diesel trainswith hydrogen. She said the move was an important first step in using clean-burningtechnologies to reach climate protection goals. Schwabl added: "We also do this because about 120 diesel trainsets in our vehicle pool willreach the end of their lifetime within the next 30 years, meaning we will have to replace them. The experience gained with this project helps us find a sustainable and practical solution." Officials say the area's many wind turbines will produce part of the energy to create thehydrogen to power the trains. Alstom says several other European countries have also expressed interest in developinghydrogen train systems. France has already said it wants its first hydrogen train to beoperating by 2022.